Perhaps a sign of what was to come a year ago happened at Bright House Field when the Phillies lost to the University of Tampa on March 1. Yes, a college team. Well, the Phillies can get revenge on Sunday afternoon again at Bright House Field. Jeremy Hellickson will start and will be backed by a lot of the young prospects in camp. Camp has been very interesting. Pitchers are playing pepper something I hadn’t seen in all my time in spring training. Pete (Mackanin) explained he wanted the pitchers to handle balls more often than the same old PFP (pitchers fielding practice). He also thought it was a good way for the pitchers to get to know each other. There are so many new faces. Plus, it gives pitchers a chance to handle a bat. Pete added to that by having pitchers field ground balls at shortstop and second base, straight on, to their left and right. Can’t believe Lefty (Steve Carlton) would have done this drill. Again, I had never seen pitchers taking grounders. I saw LA (Larry Andersen) watching and had to laugh. He hated PFP. One morning, Bowa was on the half-field working with J.P. (Crawford). They worked on fielding ground balls and flashing across the bag on double plays. Bowa was showing him how to catch the ball, set his feet, turn and throw. He also spent a long time just talking with J.P. There’s no better person to teach playing that position than Bowa. Before the first full workout every year a meeting is held in the clubhouse and everyone gets introduced from the coaches, instructors, trainers, clubhouse and all the front office staff. Different people speak. The room was always so full that many of the non-uniform staff were hidden in the corners during the intros. On Tuesday, the meeting took place in the large Training Facility at the complex that houses a weight room and six indoor batting cages and pitching mounds. The players were seated and all of us who got introduced stood in the front. This way everybody saw everybody. This was another first for me. My role in that meeting is to remind everyone of the annual team golf tournament at nearby Belleair Country Club that will take place next Monday. Somehow, I was put in charge years ago. We’ll have a draft on Sunday. For the first time I didn’t get any flack from the players. However, stand by. Or, maybe it’s just another example of all the new players. The Phillies Grapefruit League schedule starts next Tuesday, 1:05 vs. Blue Jays at Bright House Field. Two teams will meet seven times in Florida. Game will be on radio, 94.1 WIP, the first of 15 on that station. Six more will be broadcast on MLB.com. Comcast Sportsnet will televise it, the first of six. TCN (The Comcast Network) will televise 13 other games. Complete spring training broadcasting schedule can be found at http://www.phillies.com/schedule. Lowest uniform number in camp is 2, rookie outfielder Tyler Goeddel, a Rule 5 draft from Tampa Bay . . . Highest number, 94 reliever Dalier Hinojosa . . . Non-roster catcher Logan Moore is #84. His dad, Brad, relieved in 8 games with the Phillies in 1988 and 1990, 0-0, 1.08 ERA. Dad wore #37 (1988) and #46 and #48 (1990) . . . Annual Major League Photo day begins at 6:30 Friday morning . . . After the workout, the players will begin signing baseballs, bats and caps for the team’s Community Outreach department. An authenticator will be on hand for the weekend. Gene Schall was an outstanding baseball player at Villanova, drafted by the Phillies and played briefly in the majors. He has a key role with the Phillies now. What is it? Check his story at http://www.phillies.com/alumni.. Fans get a close-up look during the daily workouts at Carpenter Complex. Photo by Miles Kennedy, Phillies photographer. 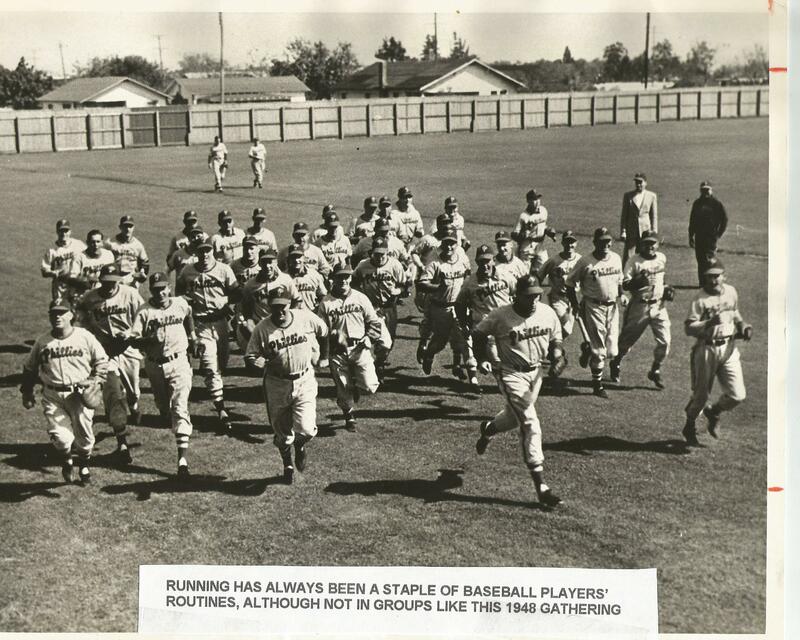 Running was part of the Phillies daily workouts in 1948 at Clearwater Athletic Field. Current Phillies have 64 players in camp, a lot more than in ’48. The Brooklyn Robins (Dodgers) were the first major league team to hold spring training in Clearwater, 1923-1932 and again 1936-41. Yep, that happened in spring training of 2004, Ryan’s first year in the major league camp. That means he has the longest tenure in this year’s camp. The following spring he wore #12. When the 2005 season started, he switched to six. He and all the rest of the infielders and the outfielders officially work out today for the first time. Ryan will have a media session after the workout ends. Last week we covered the competition that’s going on with the pitching staff. Well, the other eight positions will have competition, too, but not as vibrant. Pretty well set with Cameron Rupp and Carlos Ruiz. Eyes in spring training will be on Jorge Alfaro, Gabriel Lino and Andrew Knapp, the team’s future. Who’s on first? A lot of eyes will be on Howard and Ruf. Ryan has struggled against lefties in recent years while Ruf feasts on them. Against right-handers, it is the opposite. Will it be a platoon? A lot of fans are down on Ryan which is a shame. He’s had an outstanding career and will go down as the franchise’s greatest first baseman. He just hasn’t been the same since Achilles and knee injuries. Cesar Hernandez will be back at second, Freddy Galvis at shortstop and Maikel Franco at third. Cody Asche and Andres Blanco will be the reserves. As reported, Asche is going to work out at first base to increase his versatility. All eyes will be on shortstop J.P. Crawford, the Phillies number #1 prospect. Many predict his arrival in the big leagues will come later in the season. Management has indicated the young prospects will be brought up when they are ready to stay. Well, here’s where there will be competition as to who will open the season in centerfield. Odubel Herrera is the incumbent, newcomer Peter Bourjos excels defensively at that position and Aaron Altherr is a gifted athlete who can play all three. Tyler Goeddel, the Rule 5 draftee and free agent David Lough can also play anywhere. Asche is more of a left fielder. Two highly-prized rookies, Roman Quinn and Nick Williams, will be watched closely. Both can play center but need more seasoning. Of the two, Williams is the most likely to end up in left or right at AAA. Of the eight outfielders in camp, only Altherr and Goeddel bat from the right side. There seems to be a shortage of right-handed hitting outfielders in the game, not just with the Phillies. Regardless of where Herrera, Bourjos and Altherr play, the Phillies will have an excellent defensive outfield this season which will certainly help the pitching staff. Jimmy Rollins (White Sox) and Jeff Francoeur (Braves) have signed minor league contracts. Phillies play White Sox four times, two at home in September . . . Guest instructors Larry Andersen and Charlie Manuel began last week. 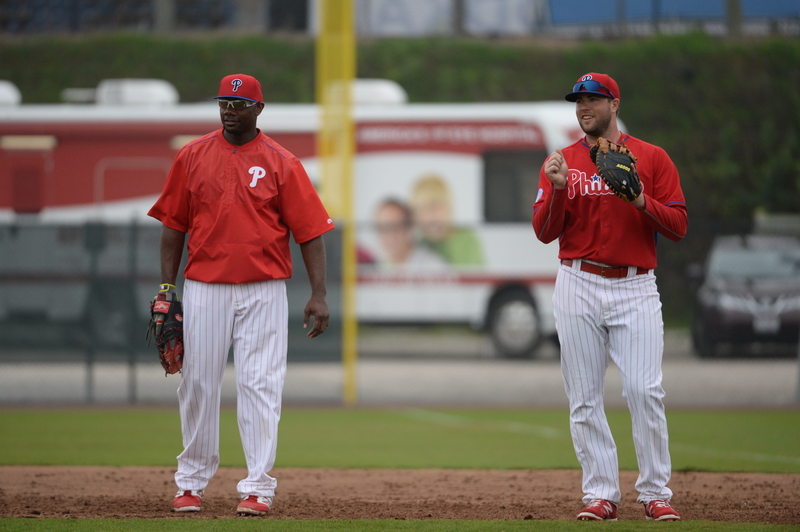 Matt Stairs and Dave Hollins joined camp yesterday . . . The Communications Department each spring provides a one-page sheet of head shots of the players in camp. It is more valuable this spring than ever before . . . Wall of Fame voting starts today at http://www.phillies.com/wof. 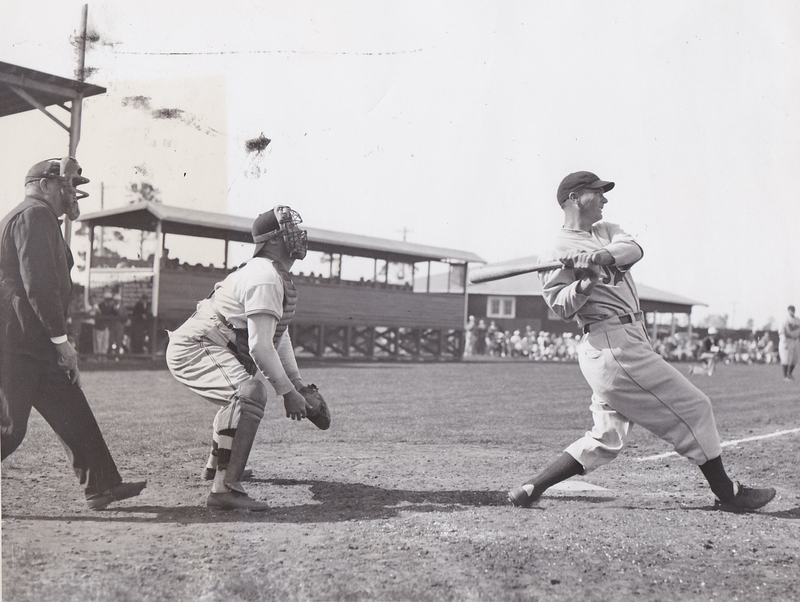 The Phillies very first spring training practice in Clearwater came on February 24, 1947, at Athletic Field. Only the Detroit Tigers have a longer tenure, having been in Lakeland, FL, consecutively since 1946. Alone but focused. Pat Gillick, senior advisor to the president & general manager, intently watches a group of pitchers throwing from the mounds at Carpenter Field. This spring is his 59th in professional baseball. 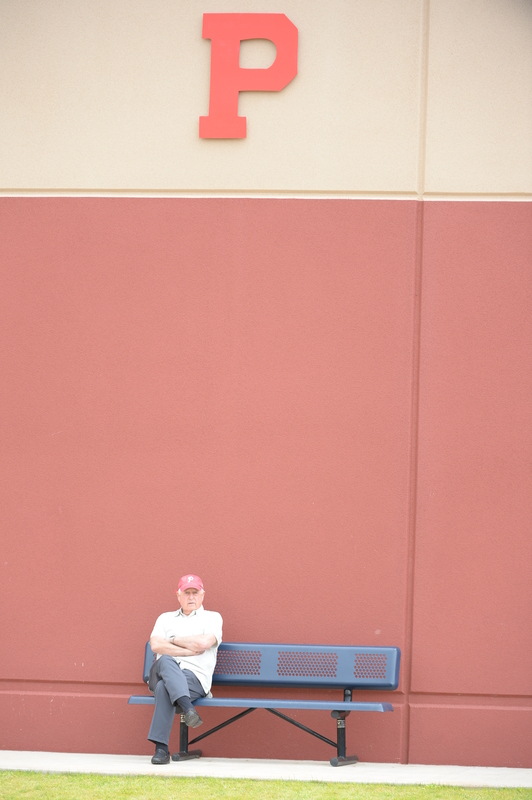 Phillies photographer Miles Kennedy. Miles Kennedy is the Phillies photographer. He’s in Clearwater providing lens gems for phillies.com, the team’s publications and photo archives. As part of the blog this spring, we’ll feature a lens gem from Miles. Each day the players begin with calisthenics and then long toss. 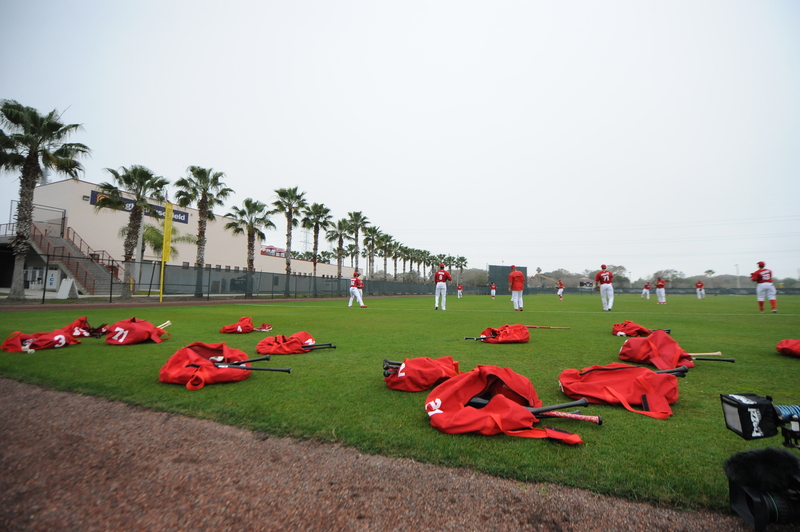 It’s been a spring training ritual that started again this morning at Carpenter Complex with pitchers and catchers. This is my 45th straight year of being in spring training with the Phillies. Every year brings change and excitement. This year is really filled with change. For the first time in my time with the Phillies the president’s office isn’t occupied by Ruly Carpenter, Bill Giles or David Montgomery. Last spring Pat Gillick sat at that desk as an interim president. Andy MacPhail is there now. Got know Andy a little bit after he assumed that role last season. I really enjoyed talking with him and hearing his perspective on baseball and our ball club. He is very thoughtful and has a plan. I believe the organization is in very good hands. Pete Mackanin moved from the coaches’ room to the manager’s office at Bright House Field. I’ve known him since 1978. He ran the daily drills the last two springs for Ryne Sandberg but he’s in charge now. Eager to see what changes he’s going to make. The GM, Matt Klentak, is new. Looking forward to getting to know him this spring. Hard to believe I’m twice as old as he. Yikes. Phillies radio broadcasts in the Philly are will now be aired on WIP 94.1 FM. Team had been on WCAU AM since 2005. Same announcers, Scott Franzke, Larry Andersen and Jim Jackson, who will again handle the pre- and post-game shows in addition to some play-by-play during home games. 15 spring training games will be aired on 94.1. All games of all teams can be heard on mlb.com through an audio package. Baseball America, in its annual rating of minor league organizations, ranked the Phillies 8th, up from 22nd a year ago . . . Nine players in Phillies history have had one at-bat in one game. Who was the latest? Where is he now? Check out the story at http://www.phillies.com/alumni . . . Fan voting for the Wall of Fame begins next Tuesday on this website. 12 Alumni are on the ballot. Five years of service time has been changed to four years by the team’s Wall of Fame Committee that annually selects the players on the ballot . . . How big a turnover has there been in the Phillies pitching department? Well, Luis Garcia has the longest tenure, three seasons. 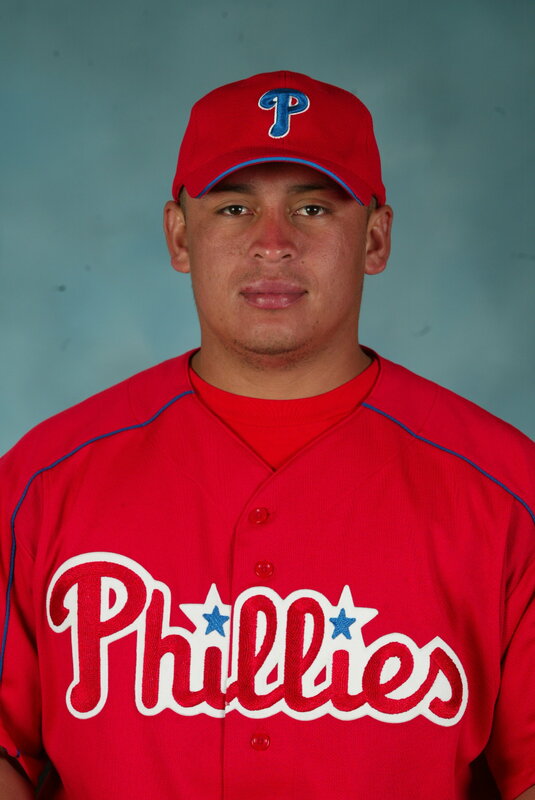 Carlos Ruiz’ first spring training camp was 2005. He wore #78. Chooch was never a non-roster player even though extra catchers are brought in from the minors. The lockers in the empty clubhouse at Bright House Field are no longer empty. Yep, the equipment truck made the 1,058-mile journey from Citizens Bank Park to Clearwater and was unloaded on Sunday. Happy Valentine’s Day. 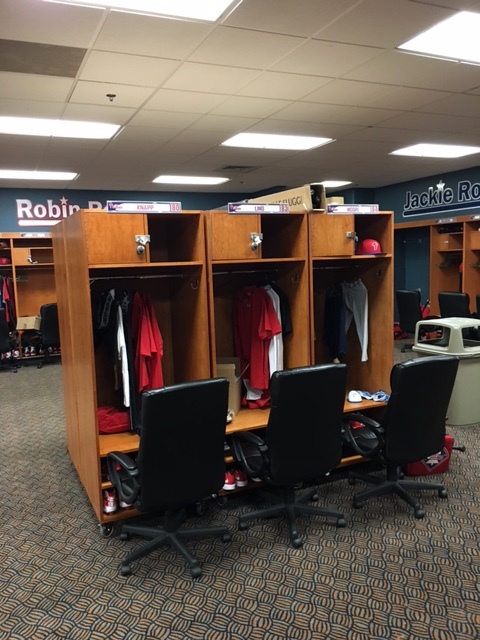 With 66 players coming to camp (so far), Frank Coppenbarger, Director of Team Travel and Clubhouse Services, had portable, additional lockers built and placed in the middle of the south end of the clubhouse. According to the Merriman-Webster dictionary, competition is the act or process of trying to get or win something (such as a prize or a higher level of success) that someone else is also trying to get or win. They’ll be plenty of competition in Clearwater leading up to Cincinnati. LH Matt Harrison, recovering from a bad back, and Mario Hollands had Tommy John surgery last season and they will be on a rehab program. That makes 35 pitchers in competition. By the April 4 season opener in Cincinnati that number will be down to 11-12. A year ago, 14 different pitchers started for the Phillies. Their ERA was 5.23, second highest in the NL and the team’s worst since 6.15 in 1930. Their 38 wins were the majors’ lowest. Aaron Nola and Jerad Eickhoff, two impressive young arms from last season, are expected to keep their spots in the rotation. Jeremy Hellickson and Charlie Morton, a pair of new veterans, will be two other starters. After that, it’s open, wide open. RH Alex Asher, RH David Buchanan, RH Severino Gonzalez, RH Chris Leroux, LH Adam Morgan, LH Brett Oberholtzer and RH Vincent Valesquez have all pitched in the majors. Looking to make impressions are RH Mark Appel, RH Zach Eflin and RH Jake Thompson, three young guns. Gentlemen, as they say in NASCAR, start your engines. Once upon a long time ago, if you wound up in the bullpen, you weren’t very good. The game as evolved to include closers, set-up guys, situational arms, one-inning pitchers and a deep bullpens. Witness the World Series trophy in Kansas City. Last month ESPN.com’s Jayson Stark wrote an in-depth article, “What is fueling baseball’s Bullpen Mania?” A very insightful article by Jayson, one baseball’s best writers. Some numbers he pointed out: 2,003 times starting pitchers failed to make it through the sixth inning last season, the most in the history of baseball. (Geez, the Phillies may have been the ring-leader). And, 15,095 pitching changes. That’s a lot of TV commercials. If you count Jeff Francoeur, 16 relievers pitched for the Phillies last season. Three recorded saves, Jonathan Papelbon, Ken Giles and Luis Garcia. So, who will the closer this year? Plenty of competition. Andrew Bailey, Ernesto Frieri, Garcia, David Hernandez, Frank Herrmann, Yoervis Medina, Edward Mujica and James Russell have all recorded saves in the bigs. Bailey, Frieri, Hernandez and Mujica have the most experience at the back end of the pen. Garcia, Jeanmar Gomez and Hernandez will occupy three of the seats in the bullpen. The others will be wide open. Will there be two lefties in the pen? Or, one? Or, none? Getting game exposure for all these arms in spring training may be challenging. Somehow it will all be sorted out. A lot of eyes will be focused on the pitchers. It all starts when pitchers step on the seven warm-up mounds at Carpenter Complex on Thursday morning. Speaking of pitching numbers. 40 years ago, the Phillies won their first division title. They used 11 pitchers all season long. That’s right, 11. Randy Lerch was the 11th and he pitched in one game, three innings of relief in game #157 on September 27. Times have changed. 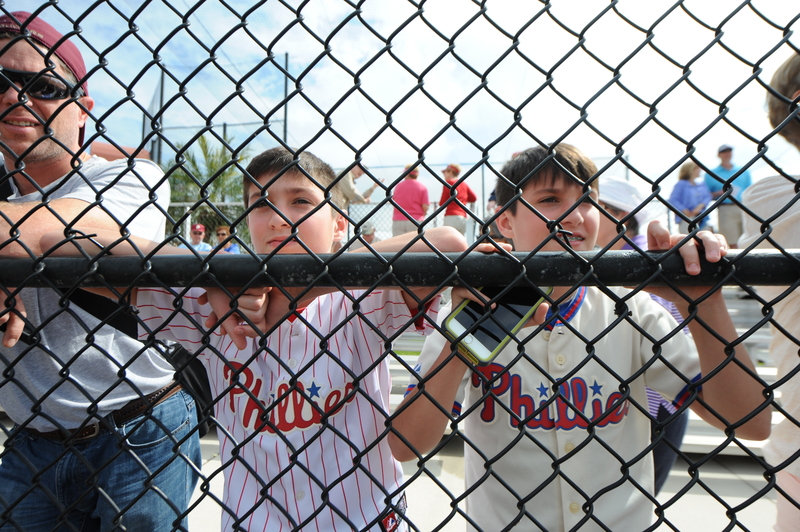 When the Phillies take the field next week, it will mark the 70th consecutive year of spring training in Clearwater. They replaced the Cleveland Indians in Clearwater in 1947. Clearwater population then was around 15,000. When did Brooklyn train in Clearwater? What was the name of the field? Where was it located? Answers to these questions and much more can be found at http://www.phillies.com/alumni. Johnny Almaraz, Director, Amateur Scouting, and his staff recently met to begin preparing for the June draft when the Phillies have the very first selection. Each area scout presented his top 15 prospects. That list will shrink over time. Phillies had several scouts at the Compton Urban Youth Academy showcase in Los Angeles the other weekend. College programs have begun practices and scrimmages. Their seasons begin February 19. Manned with game schedules, radar guns, lap tops and GPSs, the amateur scouts will be busy between now and the draft. According to several reports, the draft is strong in college pitching this year. For the group of pro scouts, their seasons are also beginning as the Phillies will cover every camp in Florida and Arizona. “The first looks at the Complex and Jack Russell Stadium were almost a spiritual experience to a baseball nut who had only heard about those shrines through newspapers, photos and occasional black and white video. 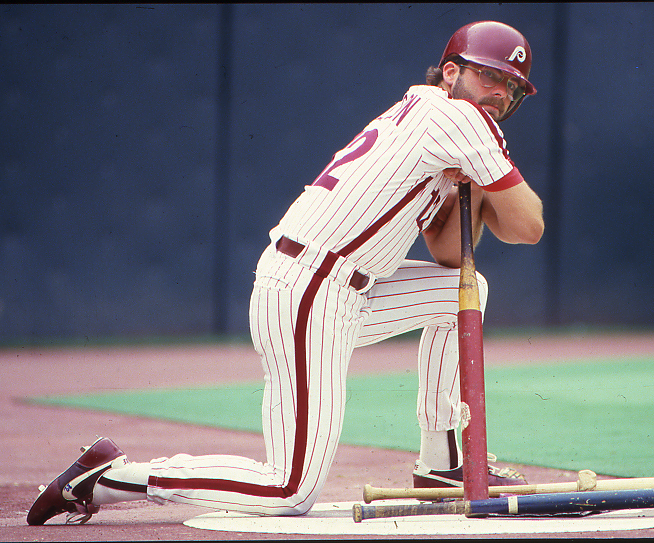 “My most memorable experience was sitting with Larry Shenk in the hotel coffee shop for breakfast when he told me we were trading Rick Wise for Steve Carlton. We both knew it was going to be an unpopular move. It was. The rest is Phillies and baseball history. My first exhibition game also was memorable. Shortly before the game Larry said the PA announcer didn’t show up and asked me, ‘Have you ever done the PA and if I would do it today?’ I had never done any such work but I instantly replied yes. Except for two years when I was part of the TV team, I’ve been the PA announcer for every Clearwater home game since then. On Friday, the Phillies equipment truck will be loaded at Citizens Bank Park. Two days later it will be unloaded at Bright House Field in Clearwater. 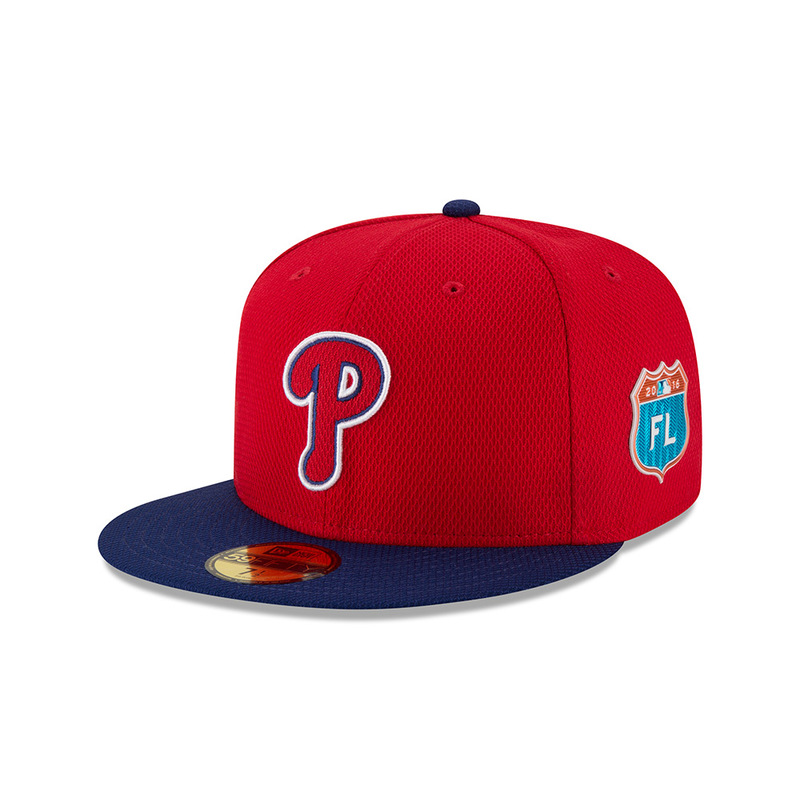 Among the trunks and boxes are dozens of hats the Phillies will wear this spring. Pretty cool. The Phillies were established in 1883 so guess who has played the most games at first base? Pretty easy guess. Now, who’s third on the list? Shockingly surprising. Check out the story at http://www.phillies.com/alumni. The cover of my new book which will be on sale starting April 1, no foolin’. 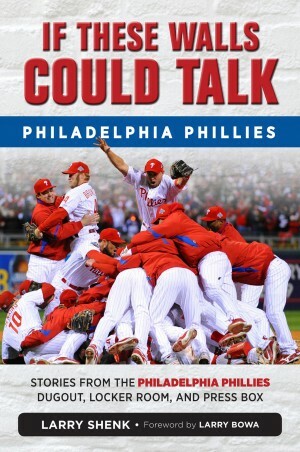 320 pages of Phillies history and Behind the Scenes stories. Triumph is the publisher. Larry Andersen wrote the foreword. 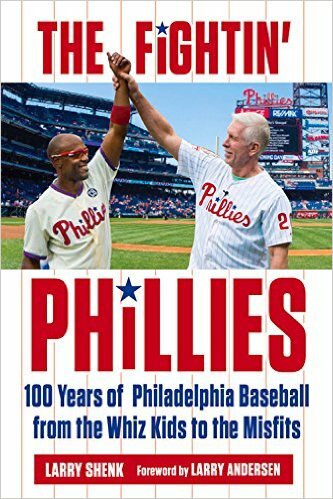 The book provides insight into a potpourri of faces, places, events, and personalities in Phillies history. One of the many historic performance features is about Jimmy Rollins passing Mike Schmidt as the franchise’s all-time hits leader. Countdown to spring training now is down to two weeks from today. 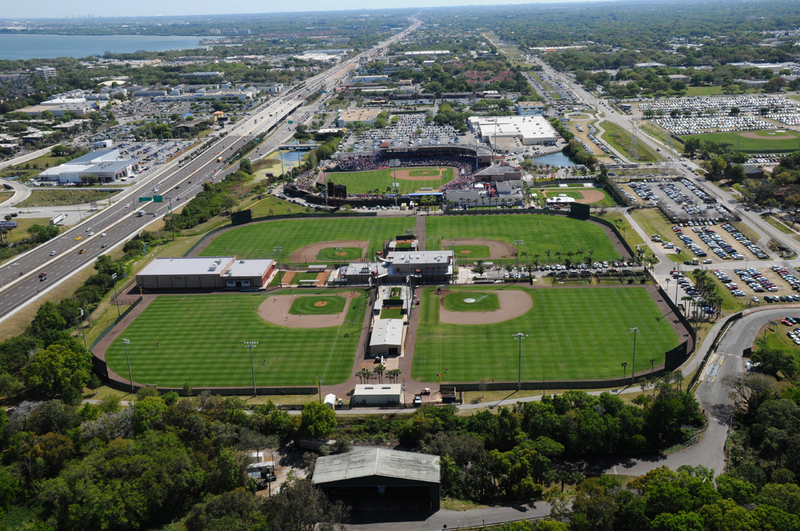 In their 70th spring training in Clearwater, the Phillies have the finest set-up in Florida with Carpenter Complex and next door Bright House Field. Both are located between Route 19 and Old Coachman Road. One of the many daily drills is PFP, pitchers fielding practice. 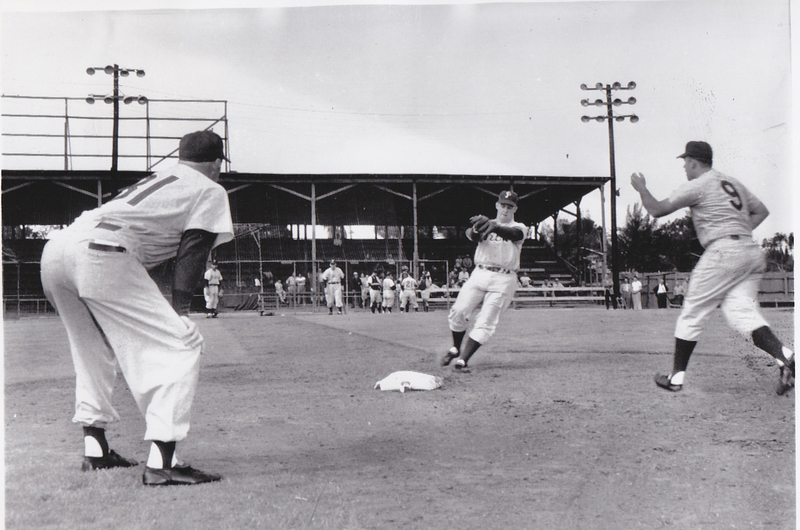 There’s a vintage photo on http://www.phillies.com/alumni of Tommy Qualters covering first base during PFP in 1956 at Clearwater Athletic Field. Even though Jack Russell Stadium was in its second year, the Phillies held a rookie mini-camp prior to spring training that year at the old ballpark. On the same webpage is an interesting story on Glenn Wilson by Paul Hagen. Wilson confides to Hagen that he had some serious problems while playing for the Phillies. Strange as “Glen-bo” was one of the fun guys to be around. ICYMI: RHP Yoervis Medina, 27, was acquired by the Phillies from the Pirates Wednesday for LHP Jesse Biddle. So who is this fella? A big dude, 245 pounds on a 6-foor-3 frame. 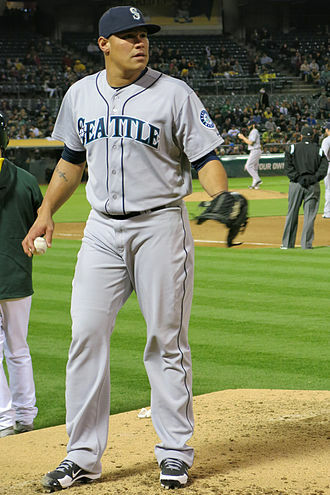 Has been strictly a reliever with the Cubs and Mariners on a limited basis. In nine minor league seasons, he started and relieved. His last start was 2012. He was originally signed by Seattle out of Venezuela, traded to the Cubs and then claimed on waivers by the Pirates on December 23. He features a four-seam fastball, an average of 92 mph. By my count, he’s pitcher #37 in camp. He’ll be in Clearwater instead of Bradenton and Biddle will be in Bradenton instead of Clearwater. Pronunciation: yo-AIR-vees meh-DEE-nah. There are a lot of components needed when building a championship club. Pitching, defense, power are three obvious ones. Not to be slighted are the positions up the middle: catcher-shortstop-second base-centerfield. We’ve looked back at the Phillies championship clubs of 1915, 1950, 1983, 1993, 2008 and 2009 and their up-the-middle players. Now, it’s time to look ahead. Dusting off the crystal, what’s the future core? A year ago at this time, this position appeared to be thin in the Phillies organization. But, Cameron Rupp, 27, stepped up and took over the starting job in the majors. He can catch and throw and has power. Coming off Tommy John surgery, 24-year-old Andrew Knapp took off last season to become a definite prospect. A switch-hitter, Knapp needs to continue improving behind the plate. 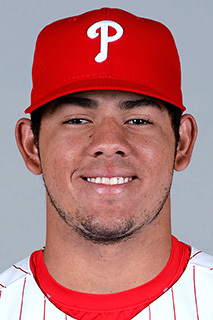 The Cole Hamels trade brought 22-year-old Jorge Alfaro (pictured) to the Phillies organization. A power bat and power arm, Alfaro is ranked 3rd among the MLBPipeline list of top 10 catchers; among top 100 prospects, 96th. Down the road is Deivi Grullon, who turns 20 on February 17. He played in low-A ball last summer and is a polished receiver. Not to be overlooked are Gabriel Lino, who was in AAA ball last year as a 22-year-old and left-handed hitting Logan Moore, 25, whose dad, Brad, once pitched for the Phillies. Freddy Galvis, 26, will be there again in 2016. 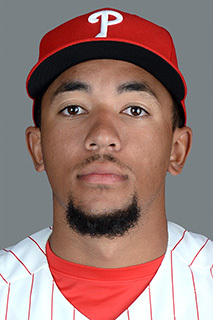 Coming soon will be 22-year-old J.P. Crawford (pictured) who split last season between Clearwater and Reading. On MLBPipeline’s top 100 players, he’s ranked fifth. Among their top 10 shortstops, second, the number he wore at Reading. Generations of Phillies fans have seen long-term excellence from Larry Bowa and Jimmy Rollins. Crawford should be the next generation shortstop. The system also includes another defensive whiz, Malquin Canelo, 21, who played for Lakewood and Clearwater. Even younger is 18-year-old Arquimedes Gamboa out of Venezuela who made his pro debut with the Gulf Coast League Phillies. 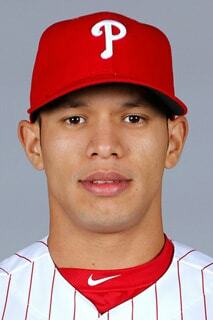 Cesar Hernandez, 25, (pictured) will be back again this season. He’ll have to battle to keep this job as Freddy could move to second when Crawford arrives. Then there’s 21-year-old Scott Kingery who went from the University of Arizona to Lakewood last summer. He’s projected as a fast track player to the majors. Among MLBPipeline’s top 10 second basemen, Scott came in at #10. 23-year-old Josh Tobias, a 10th-round pick last summer out of the University of Florida, led Williamsport in hitting. He’s a switch-hitter. Line ‘em up. Incumbent is Odubel Herrera, the 24-year-old hitting machine who turned in an impressive rookie season in ’15. It was his first full season playing this position. 25-year-old Aaron Altherr can excel defensively at all three outfield positions but will probably settle in right field. Nick Williams, 22, is another product of the Hamels trade. He has all the tools and played center at Reading. Tyler Goeddel, the 23-year-old selected in the Rule 5 draft, has the tools to play anywhere in the outfield. 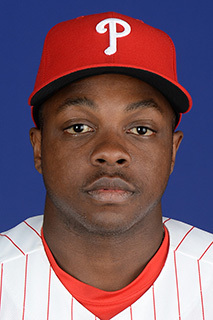 Then there’s 22-year-old Roman Quinn (pictured), a base-stealer and lead-off type hitter. A converted shortstop, he has a strong arm. Among the MLBPipeline’s top 100 prospects, Williams ranked 64th and Quinn 99th. In case you are wondering, Herrera and Williams bat left, Altherr and Goeddel, right and Quinn is a switch-hitter. Centerfield should be fun to watch. ICYMI: The Phillies have seven players among the MLBPipeline’s top 100, most of any of the 30 big league teams. In addition to Alfaro, Crawford, Williams and Quinn, OF Cornelius Randolph (84), RHS Mark Appel (70) and RHS Jake Thompson (55). Four of the seven came via trades. Randolph was their first-round selection last summer. Matt Klentak made another waiver claim last week, taking 29-year-old LHR Bobby LaFromboise (pronounced lah-frahm-BOYCE) from the Angels. He’ll be in the mix for a bullpen job. His big league career exists of brief moments in each of the last three seasons, 27 total games, 22.1 innings, 20 hits, 5 walks, 23 strikeouts, 0-1, 3.63 ERA. The 6-foot-4 lefty was a minor league All-Star in 2011-12. Some interesting notes about Bobby: He was drafted by the White Sox out of high school (2005), the Diamondacks out of junior college (2007) and signed with Seattle after the Mariners drafted him in the eighth round (2008) out of the University of New Mexico . . . He’s been claimed on waivers four times, Padres (4/2/14), Pirates (8/24/14), Angels (12/23/15) and Phillies (1/29/16) . . . He never put on an Angels uniform . . . While in high school, he climbed the San Gabriel mountains . . . His favorite food: chicken and dumplings . . . College major: accounting.